Way back in 1969 when Dr. Seuss wrote this book, “lick” was a term that meant beat-up, like in a fight. You might be watching a boxing match and say, “I think Joe Frazier is going to lick Muhammad Ali.” That meant you thought Frazier would win the fight. Now a days, if you said that one boxer would lick another, you’d have a very disturbing fight on your hands. I don’t think any one would watch that on Pay-Per-View. It’s weird how words change and grow over time. Anyhow, I Can Lick 30 Tigers Today! is not about swiping your tongue across a streak of tigers (yup, a streak of tigers is the term you use for a group – just like a flock of geese, a pride of lions or a murder of crows – collective nouns are weird too). 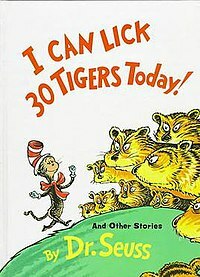 It’s about a young boy, who looks a lot like a 7 year old Cat in the Hat, who decides that he can beat-up 30 tigers. He brags about his ability to beat the whole ambush (that’s another collective noun for a group of tigers), until the tigers all show up, then, one by one, he starts back tracking – saying, maybe it’s better if he only fights 29, 28, 25… Of course, this is all done in Dr. Seuss’ silly, rhythmic style. The second story in the book – King Looie Katz – is about a king who doesn’t want his tail to ever touch the ground, so he hires a servant to carry it around behind him. The servant gets jealous and wants someone to carry his tail too. Then the servant’s servant wants a servant, and pretty soon the whole town is walking around in a giant parade of tail carriers. Finally, there’s my favorite story in the book – The Glunk That Got Thunk. This one’s about a little girl, who also looks like a younger version of the Cat in the Hat, who uses her imagination to create fun friends and situations. One time, however, she goes to far and thinks up a Glunk, an obnoxious and rude creature who wreaks havoc on the girl’s life. It’s a good collection, but really, how many bad books did Dr. Seuss write? These are just like his others – they’re fun, funny, and great to read aloud. Each of the stories also has a hidden message, just like so many of Dr. Seuss’ stories. This book was #7 in my attempt to read 90 books in 90 days this summer vacation. So far I’m right on track, 7 books in 7 days. Follow me here if you want to see if I can make it.